Tanner Sandlin was finally proud of owning Air Raid after he found out the video game was worth a lot of money. (Mental Floss) -- While reading a story on this site about rare video games, Tanner Sandlin of Austin, Texas, recognized one of the games -- Air Raid for the Atari 2600. 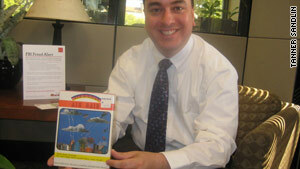 He found the thirteenth known copy of the game in his garage and put it on eBay. It sold last Sunday for $31,600, the second-highest price ever paid for a video game. Sandlin bought the game when he was 11 or 12 years old at a store called Tuesday Morning in Arlington, Texas. The store bought overstocked or undersold goods from other retailers and sold the items at a discount. Sandlin said he paid between $5 and $10 for Air Raid in the mid-1980s. This is important because none of the other twelve people who possess Air Raid cartridges were the original owners -- they bought them at auction, secondhand stores, or through private collectors. Learning a collectible item's "provenance," or owner history, is key to proving its authenticity. Since Sandlin was the original owner, his cartridge had more credibility than one found in a box at the local thrift store. Oddly enough, Sandlin remembered that this much sought after game wasn't really all that great. In fact, the only reason he still had it was because it was so bad. He and his friends used to borrow games from each other all the time --sometimes you'd get your game back, sometimes you wouldn't, and that was OK. But no one wanted to keep Air Raid, so it kept coming back to him. While it's impressive that Sandlin had the thirteenth known copy of Air Raid, he also had the original packaging, which changed everything. Why? Because his was the only known Air Raid box in the world, making it the only known complete copy of the game in existence. But he couldn't start counting his fortune just yet. If you're willing to pay thousands of dollars for a video game, you're going to make sure it's legitimate. Sandlin knew this, so he went straight to an expert, Albert Yarusso of AtariAge.com, a forum for fans of anything Atari, to get his professional opinion on the authenticity of the find. The two both live in Austin, so Yarusso met with Sandlin and examined both the game and the box in person. After some thorough research, Yarusso declared everything was real (or the most impressive forgery he'd ever seen). With expert confirmation behind him, Sandlin pulled his stand-alone cartridge auction on eBay and replaced it with the complete game package. The starting price was $.50. Sandlin's eBay auction ended on April 10, 2010 at about 10:15 p.m. EST. With only 5 minutes to go, the highest bid was $14,600. It sat at this price until the very last few seconds, when it jumped to $17,528, and then made a giant leap to $31,500. The final bid was $31,600. I asked Sandlin what he intended to do with the money and he wasn't quite sure yet. He did know that he wanted to buy something tangible; something he could point at it and say, "I bought that with a video game!" Now if you'll excuse me, I have to go look for something in my garage.